Khanh Nguyen’s mother won’t talk about how his two oldest brothers died. All she will tell him is that they succumbed to disease in Malaysia because there wasn’t the right kind of medicine in the communist camp where they lived. 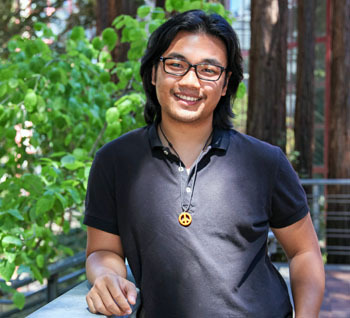 Now, Nguyen is headed to UC Santa Cruz to study biochemistry and eventually become a physician with the goal of working for the World Health Organization in order to help people like his family. “Being a doctor has always been my calling,” says Nguyen who hopes to graduate in 2017. “I’ve never doubted it. A recipient of the $20,000, two-year Karl S. Pister Leadership Opportunity Award, Nguyen’s story of perseverance is awash in tragedy, hard luck, and equally hard work. Tossed out of the communist camp after its closure in 1994, Nguyen and his mother were left without a home or a country. They fled to his mother’s native Vietnam but were forced to leave because of an abusive living situation and finally found themselves in Salinas, California, where his mother worked a series of low-income jobs in order to support her small family. Jobs were won and then lost. Landlords preyed on the family because Nguyen’s mother did not speak English. “I was forced to grow up very soon,” remembers Nguyen, who pushed himself to learn English in order to help his mother. By the time he was in third grade, he was the one filling out school forms for himself and his younger brother, signing permission slips, and even helping his mother file her taxes. Struggling with poverty, bullied because of his culture, and grappling with the growing knowledge that he was gay, Nguyen found himself facing a choice to give up or to move forward. Inspired by a visit to his high school by Oscar-winning screenwriter Dustin Lance Black (“Milk,” “J. Edgar”), Nguyen — who’d only recently come out — decided to form a Gay-Straight Alliance on campus in order to create a safe place for people like himself. He also took advanced classes in school, earned good grades, and spent a Rotary-supported year abroad becoming fluent in Japanese. He began to apply to colleges. Instead, Nguyen landed at Hartnell College in Salinas. At Hartnell, Nguyen joined the Math Club, taking math games into elementary schools to help children develop a love of the discipline. He also was awarded two math internships in Mexico, studying the Fibonacci sequence at the Centro de Investigación en Matemáticas and prime numbers that could be used for Internet security at the Universidad Nacional Autónoma de México. As part of UC Santa Cruz’s STEM Diversity program, he also recently spent his summer working at various biomedical research labs on campus and will begin classes in the fall. "He is so committed to making the world a better place, he will do whatever he needs to get where he wants to be,” Moreno said.